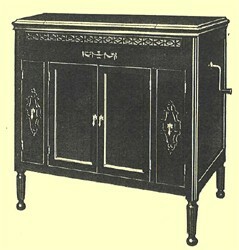 CABINET:--Mahogany, high-class piano finish. The cabinet is of special design, records being accommodated at each end of cabinet, with the amplifier concealed in the centre. Unfortunately, there are no recent photographs of this model to post on this page at this time.